Palm Sugar Kakait Village, Gift Shop Uniquely Lombok. You are looking for a unique gift and typical of the island of Lombok? You can buy Palm sugar Kakait Village typical of Lombok. Palm sugar in the village of Kakait. Farmers and traders are most residents in the village of Kakait. You can see lots of tree plantations of Palm in the village of Kakait. The results of the gardens were usually sold to the market. However, if you pass the village of Kakait you will surely find the traders sell his garden on the side of the road. The popularity of water tuak usually pulls the rider to drop by and enjoy it. Not only that you can also find kolang kaling and Palm sugar. 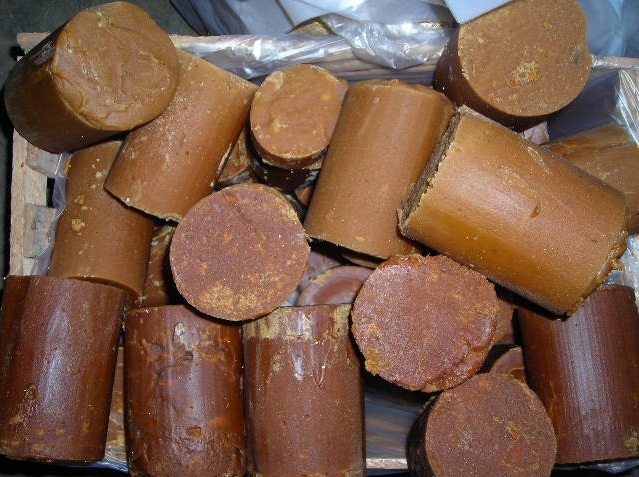 To make Palm sugar, flower tree jatan enau collected first in a bamboo mold. This prevents nira nira due to brewing experience undergoing fermentation cannot be used to make Palm sugar. Hence the usefulness of the bamboo pillar plus laru or kawao function for a natural preservative. NIRA will be simmered on top of the wait with a large frying pan. In this cooking, the wood to wait for very caredPalmwoodm wood used an old one. This is because wood old aren can accelerate the cooking process. Although cooking with wood, but it's faster to make Palm sugar should use the api that is not too large. Because if you use the high heat will scorch the sugar and taste will be bitter, its color becomes black. After being a thick and hard or heavy when stirring means Palm sugar is ripe. Prove Palm sugar is ripe or not can also be removed with a dough from the Pan and poured again. If the mortar will break up. Then if the batter is poured into the water ginggin, the liquid will form a thread and not dotted, then the dough is ready for printing. The liquid sugar is printed in a coconut Shell-Shell, then after harden issued from their molds. In the village of Kakait this you not only get to see the process of making Palm sugar. You can also see the community benefit from this tree village Palm with a variety of ways. You can see the making of the kolang-kaling, the kolang-kaling is made from the fruit of the areca palm. You can also see the making of Palm fiber from trees enau woven into rope.